Much of the drug traffic originates in the Menagers Dam area, the Vekol Valley, Stanfield and around the Tohono O’odham Indian Reservation. It even follows a natural gas pipeline that runs from Mexico into Arizona. In these areas, which are south and west of Tucson, sources said there are “cartel scouts galore” watching the movements of federal, state and local law enforcement, from the border all the way up to Interstate 8. The agents blame part of their plight on new policies from Washington, claiming it has put a majority of the U.S. agents on the border itself. One agent compared it to a short-yardage defense in football, explaining that once the smugglers and drug-runners break through the front line, they’re home free. The Department of Homeland Security denies it has ordered any major change in operations or any sort of change in forward deployment. While agents in the area agree that southwest Arizona has been a trouble spot for more than a decade, many believe Washington and politicians “who come here for one-day visit” aren’t seeing the big picture. They say the area has never been controlled and has suddenly gotten worse, with the cartels maintaining a strong presence on U.S. soil. More than ever, agents on the front lines are wearing tactical gear, including helmets, to protect themselves. Without placing direct fault on anyone, multiple agents told Fox that the situation is more dangerous for them than ever now that the cartels have such a strong position on the American side of the border. They say morale is down among many who patrol the desolate area, and they worry that the situation won’t change until an agent gets killed. “Son of Hamas” author Mosab Hassan Yousef revealed on a blog hosted by his publisher he is scheduled to appear June 30 before Immigration Judge Rico J. Bartolomei at the DHS Immigration Court in San Diego. An incredulous Yousef said the U.S. government’s belief he is a terrorist is based on a complete misinterpretation of passages of his book in which he describes his work as a counterterrorism agent for the Israeli internal intelligence service Shin Bet. “If Homeland Security cannot tell the difference between a terrorist and a man who spent his life fighting terrorism, how can they protect their own people?” he asked in his blog post. Yousef’s asylum case – A 088 271 051 – was filed Aug. 22, 2007, about seven months after he arrived in the U.S. from Israel. The office of DHS Senior Attorney Kerri Calcador, who is handling the case, referred WND’s request for comment to Immigration and Customs Enforcement spokeswoman Lauren Mack, who said the agency is barred by policy from commenting, or even confirming or denying the existence of any case. WND tried to reach Yousef for further comment, but he was not available. As WND reported, Yousef worked alongside his father, Sheik Hassan Yousef, in the West Bank city of al-Ghaniya near Ramallah while secretly embracing Christian faith and serving as one of the top spies for Israel’s internal security arm. Yousef was recruited by Shin Bet in 1996 at the age of 18 while at an Israeli detention facility. His chief Shin Bet handler, “Captain Loai,” has confirmed his account and praised him in media interviews for disrupting dozens of suicide bombings and assassination attempts by Hamas, saving hundreds of lives. Yousef said he recently received a document from DHS in which attorney Calcador pointed to passages in his book as evidence of terrorist activity. Yousef explained his job as a Shin Bet agent required him to be involved with his father’s activities. “So when he asked me to go with him to pick up these guys when they were released from the Palestinian Authority prison, I went,” he said. He insisted that no one at the time – not his father or even Israel – knew the five men were involved in suicide bombings. He further argued he was the one who later provided Israel the evidence that connected the men to the terrorist bombing at the Hebrew University cafeteria in July 2002. He explained it was “part of his job” to pose as a terrorist and participate in “terrorist meetings” with Palestinian leader Yassir Arafat, his father and other Hamas leaders. “I passed on to the Shin Bet all the information I gathered during those meetings and saved the lives of many people – including many Americans,” he said. Yousef said his intent for writing the blog post was to alert Americans to the danger they face. “I believe that God is using this situation to expose the weaknesses of Homeland Security and to put pressure on it to make changes that can save lives and preserve freedom,” he said. He said the officials were shocked. “I wanted them to see that they have huge gaps in their security and their understanding of terrorism and make changes before it’s too late,” Yousef explained. “They told Homeland Security that I am not a threat and advised them to drop the case. But Homeland Security shut its eyes and stopped up its ears and told the FBI, ‘You have nothing to do with this. It is our job,'” Yousef said. “If Homeland Security cannot understand a simple story like mine, how can they be trusted with bigger issues?” he asked. “They seem to know only how to blindly follow rules and procedures. But to work intelligence, you have to be very creative. You have to accept exceptions. You need to be able to think beyond facts and circumstances. “Homeland Security has absolutely no idea of the dangers that lie ahead,” he said. He warned the U.S. is not prepared as al-Qaida adapts its strategy to lessons learned from terrorist groups like Hamas. “For nearly 30 years, I watched from the inside as Hamas dug its claws deeper and deeper into Israel. They started awkwardly, clumsily, but they got good at it. And al-Qaida is becoming more like Hamas,” he said. “They don’t have nuclear bombs, so they send a suicide bomber here, another one there. And over the years, they severely damaged the economy and gave Israel a bad reputation all over the world,” Yousef said. While al-Qaida began with massive attacks like 9/11, Osama bin Laden “understands how effective the Hamas strategy will be on American soil,” he said. The U.S. has experienced nothing like Israel has endured, said Yousef, and the country is not ready. “Try to imagine attacks by suicide bombers and car bombers, attacks on schools, in shopping malls, in the gridlock of rush-hour traffic, week after week, month after month, year after year, here and there, in big cities and rural towns,” he said. PHOENIX – Justice Department officials told Arizona’s attorney general and aides to the governor Friday that the federal government has serious reservations about the state’s new immigration law. They responded that a lawsuit against the state isn’t the answer. “I told them we need solutions from Washington, not more lawsuits,” said Attorney General Terry Goddard, a Democrat. The Justice Department initiated separate meetings by phone and face-to-face in Phoenix with Goddard and aides to Republican Gov. Jan Brewer to reach out to Arizona’s leaders and elicit information from state officials regarding the Obama administration’s concerns about the new law. Do Not Call Those Waging War Against America What They Are! The president’s top counterterrorism adviser on Wednesday called jihad a “legitimate tenet of Islam,” arguing that the term “jihadists” should not be used to describe America’s enemies. The technical, broadest definition of jihad is a “struggle” in the name of Islam and the term does not connote “holy war” for all Muslims. However, jihad frequently connotes images of military combat or warfare, and some of the world’s most wanted terrorists including Usama bin Laden commonly use the word to call for war against the West. “Moreover, describing our enemy in religious terms would lend credence to the lie propagated by Al Qaeda and its affiliates to justify terrorism — that the United States is somehow at war against Islam,” he said. 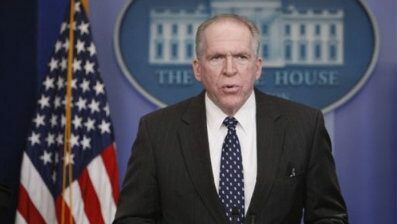 The comment comes after Brennan, in a February speech in which he described his respect for the tolerance and devotion of Middle Eastern nations, referred to Jerusalem on first reference by its Arabic name, Al-Quds. “In all my travels the city I have come to love most is al-Quds, Jerusalem, where three great faiths come together,” Brennan said at an event co-sponsored by the White House Office of Public Engagement and the Islamic Center at New York University and the Islamic Law Students Association at NYU. Author AKA John GaltPosted on May 27, 2010 May 27, 2010 Categories "1984", 2012, 9/11, America, American Freedom, American History, Crime, Education, Freedom of Speech, Government Corruption, Government Fraud, Immigration, Justice Department, Marxism, Military, Mosques, Pentagon, President of the U.S., Progressives, Propaganda, Religion, Rule of Law, Socialism, Terrorism, Uncategorized, War, War on Terror, Western CivilizationTags American Military, Comrad Obama, Freedom of Religion, Government Lies, idiocracy, Ignorance, Islam, Islamic Extremists, Muslim Extremists, politics, religion of peace, Religious Expression, stupidity, terrorism, Violence, War1 Comment on Do Not Call Those Waging War Against America What They Are!